Christmas in Venice? Cold, uncrowded… and magical! With Venice’s already-gorgeous canals, piazzas and ornate architecture lit up with Christmas decorations, the streets less crowded than in the height of the tourist season, and locals doing their Christmas shopping, the holidays make for a fantastic time to visit. Just be sure to bring warm and waterproof clothes in case of acqua alta (here’s more about how to survive Venice’s floods!). Highlights of December and January include shopping for gifts (world-renowned hand-blown glass or lace, anyone? ), midnight Mass at St. Mark’s and fireworks on New Year’s Eve! 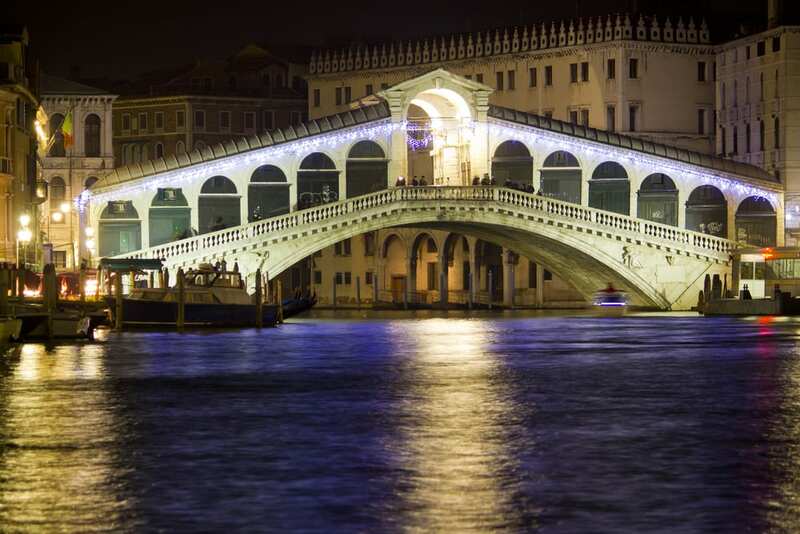 Read on for our guide to making the most of Christmas and New Year’s in Venice. The magical city gets well, even more magical during the Christmas holidays! You’ll find lights and gorgeous decorations all over Venice, even on the gondolas. (Here’s more about taking gondolas in Venice!). Festive songs are sung at special concerts in churches and piazzas throughout December, and church bells are rung all day on Christmas Day from the famous bell tower at St. Mark’s. Hanukkah is also celebrated by Venice’s large Jewish community with beautiful decorations like large, illuminated menorahs—especially in the sestiere of Cannaregio, historic home to Venice’s Jewish Ghetto. (Find out more about the sestieri, or neighborhoods, of Venice!). Venice is a wonderful city for Christmas shopping, thanks to its unique handmade gifts like glass ornaments and lace decorations. We especially love Campo San Polo’s small Christmas market, with its stands of local treasures and ice skating rink! Please note that the famous Santo Stefano market has been closed indefinitely. With Carnival right around the corner, you’ll also find lots of decorative masks at the market (and, of course, in the shops). (Don’t miss our guide to Carnival and where to buy Venetian masks!). For a truly unforgettable shopping experience, we recommend a day trip to the nearby island of Murano for the Natale di Vetro (Christmas of Glass) celebration, with lots of great glass gift options. If you’re an art-lover and heading to Venice over the holidays, you’re in luck: It’s the perfect time to enjoy centuries-old churches and masterpieces without the large crowds. Keep in mind that the city’s churches are closed to visitors on Christmas Day and open only around the Mass schedule. Doge’s Palace: The Gothic palace of the former Venetian leading family is closed on December 25th and January 1st. Galleria dell’Accademia: Home to pre-19-century art and Da Vinci’s “Vitruvian Man” (which is occasionally on display), the gallery is closed on Dec. 25 and Jan. 1. Peggy Guggenheim Collection: The 20th-century art collection is closed on Dec. 25, but it’s one of Venice’s only museums open on New Year’s Day. Ca’Rezzonico: The 18th-century Venetian art museum is closed on Dec. 25 and Jan. 1. Museo Correr: Venice’s art and history museum is closed on Dec. 25 and Jan. 1. 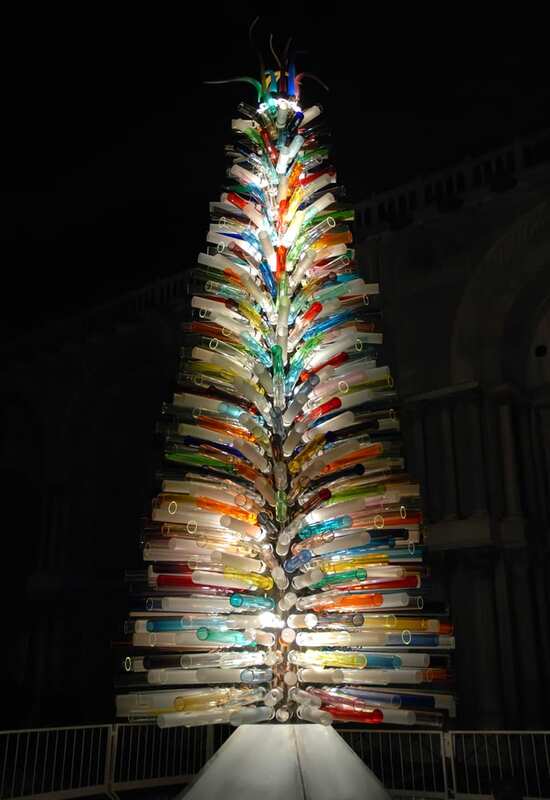 You can’t get a better symbol of Venice at Christmas than this: a Christmas tree… made entirely from Murano glass! Most stores and restaurants are closed on Christmas Day so locals can celebrate with loved ones over a large lunch. Still, there are a few great options for a traditional meal like Alle Testiere, Corte Sconta, Anice Stellato and Trattoria La Furatola. (Just remember to book as soon as possible!). The same will be the case for New Year’s Day. The vaporetto (water bus) schedule runs on a limited schedule over the holiday season, so be sure to check the timetable before planning your trip around the city. Private water taxis can be rented, but will be even more expensive on Christmas than other days. Venetians celebrate la vigilia, Christmas Eve, with a multi-course fish dinner. Many follow the meal with a midnight Mass at Saint Mark’s Basilica with services in Italian, English, French and German. Midnight Mass technically starts at 11:30pm, and we suggest getting there a few hours early to reserve a seat! Christmas Day is usually celebrated with a large lunch with family and opening presents. (Don’t miss our post on how to eat like an Italian over Christmas!). 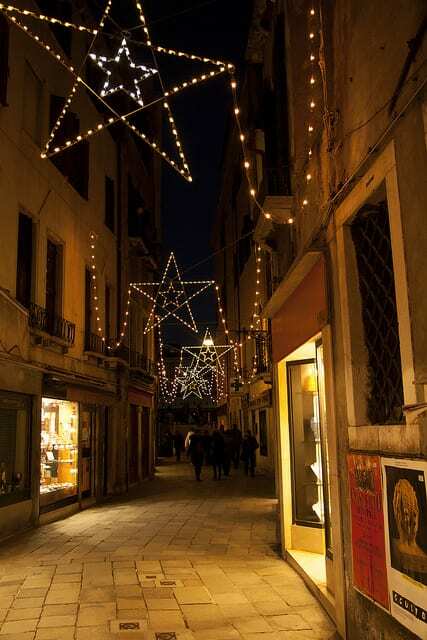 After the Christmas celebrations are over, Italians also celebrate Santo Stefano, Decmber 26, with a national holiday. We recommend following the Venetians to the free concert at the Santa Maria Gloriosa dei Frari church at 4pm—the perfect way to enjoy the choir and historic church. New Year’s Eve in Venice usually starts with an elegant meal that ends just in time to catch the fireworks at midnight! Reservations for dinner should be made well in advance; some of our favorite spots open on New Year’s Eve include Terrazza Danieli, A Beccafico and La Porta D’Acqua. St. Mark’s Square gets lively once the sun goes down, with a masquerade-themed party complete with live DJs and performances, and colorful fireworks at midnight. The piazza is packed with people, so head to Piazza Ferretto de Mestre or Punta della Dogana for a less crowded celebration. Or, if you’re looking for a unique way to ring in the new year, head to the La Fenice Theatre for an elegant opera the evening of the 31st. As per tradition, brave swimmers head to the Lido for a winter swim, starting the year off with a burst of energy! Another unique tradition? On Jan. 6, Venetians celebrate la befana by dressing up as the beloved “good witch” and competing in a rowing race on the Grand Canal. (Don’t miss our post on la befana and who she really is!). Want to take a short break from the holidays in the city and enjoy the picturesque mountains? The picturesque Dolomites are nearby, perfect for a day or weekend ski trip! We recommend renting a car to reach the mountains as shuttles may run on limited holiday schedule. Have you ever visited Venice during the holiday season? What did you think? Tell us in the comments! Spending Christmas in Venice can give you an experience of a lifetime. And your trip would be incomplete without Murano glass shopping. A swim to the Lido in chilling winter will certainly test your mettle. A really beautiful post from you, Elena! Hi Elena, very good tips!! If I may advise I would definitely recommend to stop in one of the Murano furnaces and admire how Murano glass is handmade by art-masters! I did it several times and it is a beautiful experience. I’ve just came back from a Christmas holiday in Venice, it was amazing!! the atmosphere was superb and reading your article I will definitely plan to spend the 2018 New Year Eve there ! I will suggest absolutely Venice during Christmas. There are not too many tourists and if you are lucky you will find cold but sunny weather. Also the hotel prices are not so high like summer of Silvester. Enter the Walks of Italy #TakeWalks Travel Photo Contest!